My experience and qualifications have been acknowledged by the professional organisations below, which awarded me their professional membership. 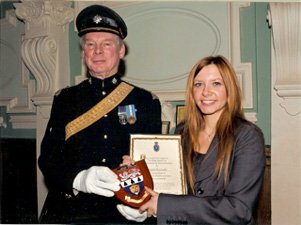 In 2008 the High Sheriff of Herefordshire and Worcestershire presented me with an award for my interpreting services in the community. The Linguist has Polish Interpreting and Polish Translation that turn all your communications into a success! After gaining a Diploma in Public Service Interpreting (Law) in 2005 I was included on the National Register of Public Service Interpreters which entitles me to work in the Criminal Justice System. I regularly work for Police, Courts, Probation Service and Prison Service as well as for Solicitors and Barristers offering them professional translation and interpreting service. My fees are usually covered by Legal Aid Commission on application by a legal representative. In 2018 I achieved ISO 17100 Qualified Translator status. I continually develop my professional knowledge and skills by attending training courses and webinars, reading subject relevant materials (in both languages) and regularly travel to Poland. I have a Bachelor’s Degree in Business Administration (Poland) and Master's Degree in International Business (England). I have been providing linguistic services to the private sector for over 10 years. I particularly enjoy working for medium and small businesses with whom I develop long standing working relationships. 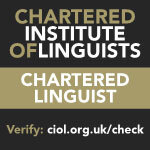 I am a Chartered Member of the Chartered Institute of Linguists and of the Institute of Translation and Interpreting having satisfied their requirements and agreed to abide by the Code of Professional Conduct and Business Practices. Although I am based in Worcestershire in the West Midlands, I cover neighbouring shires such as Herefordshire, Shropshire, Gloucestershire, Warwickshire and the Birmingham area. I can offer you Polish interpreting on both a regular and an ad hoc basis.